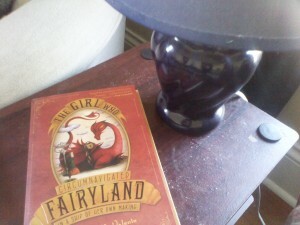 It’s on my bedside table because it’s a good book to read in a cozy place. I recently read The Girl who Circumnavigated Fairyland in a Ship of her own Making, by Catherynne M. Valente. The book is endearing right from the beginning, but even more so after the main character, September, meets a wyverary, a creature who is half wyvern and half library (on his father’s side). How could I not love that? Shortly after, there is a passage about a bathhouse run by a soap golem named Lye. It sums up a lot of what I loved about the book: that it is adorable, whimsical and imaginative, yet so smart at the same time. In the first few chapters, I thought the book was mostly smart in the sense of cleverness, but the baths September goes through show how much wisdom is in the book as well. September first has to go through a Bath of Courage (it’s not called that in the book, at least not with the capital letters), in which she is washed of the various fears that accumulate throughout life. Valente describes the process of courage-washing, in rich language, lyrical yet simple. Realizing how much fear has influenced my adult life, and trying to change that, has been a huge undertaking in the latter half of my twenties. In fact, due to anxiety after anxiety, it took me nearly a year to fill out the About Me page on my own website. Lye the soap golem informs September that the service of courage-washing is difficult to come by in our own world. Very true. The water of the bronze tub gleamed icy and green, redolent of mint and forest nights and sweet cakes, hot tea and very cold starlight. I think that the idea of washing your wishes is a creative way to rephrase a wise piece of advice: that wisdom comes from accepting the world as it is, and acting accordingly. In The Legend of Korra, one of my all-time favorite TV series, cartoon or no, Tenzin gives Korra this same advice. And it’s easy to gloss over when Tenzin says it, because, yeah, whatever, Tenzin is super wise and stuff. He’s saying wise things all the freakin’ time, so it’s easy to overlook the true gems and give them their due. But reading Lye’s version of this idea, and how September processes it, brings the point home. Like dealing with accumulated fear, this is another piece of advice that has been hard-won in my own life, and I hope Valente succeeded at passing on that wisdom to younger readers.